Embark on an incredible 10 day journey through the Andean oasis of Colombia and begin a love affair with the vibrancy, spirit, and passion of this emerald of the Caribbean coast. Visit Bogotá – Colombia’s beating heart. Fly over mystic valleys and stand at the foot of the Andes in Colombia’s verdant coffee region, where wax palms tower overhead and the secrets to perfect Colombian coffee are revealed. On a journey of discovery, tour the murals of Medellín’s Comuna 13 with a neighbourhood resident. Venture to the Cocora Valley in 4x4 “Willys” then hike or explore on horseback – the choice if yours! 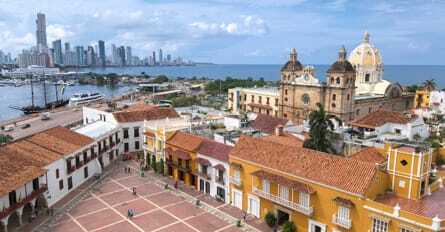 Line the aisles of a sensory buffet at Paloquemao market, and indulge in the romance and history of sultry Cartagena. Learn the traditional ways of cooking Colombian cuisine during a culinary workshop. When you experience Colombia, you discover earthly treasures swept across stunning Caribbean landscapes that enliven the spirit – and sense of adventure – around every turn.